There are a number of gorgeous venues available to brides and grooms who are looking to have a Litchfield County Wedding. Located in northwestern Connecticut, and not far from New York City, a Litchfield County Wedding is an ideal choice for couples in the area. One of the county’s most notable venues is the beautiful Candlelight Farms Inn. The inn is known for hosting personalized, elegant country weddings, with a variety of options for couples to work with to create the wedding of their dreams. 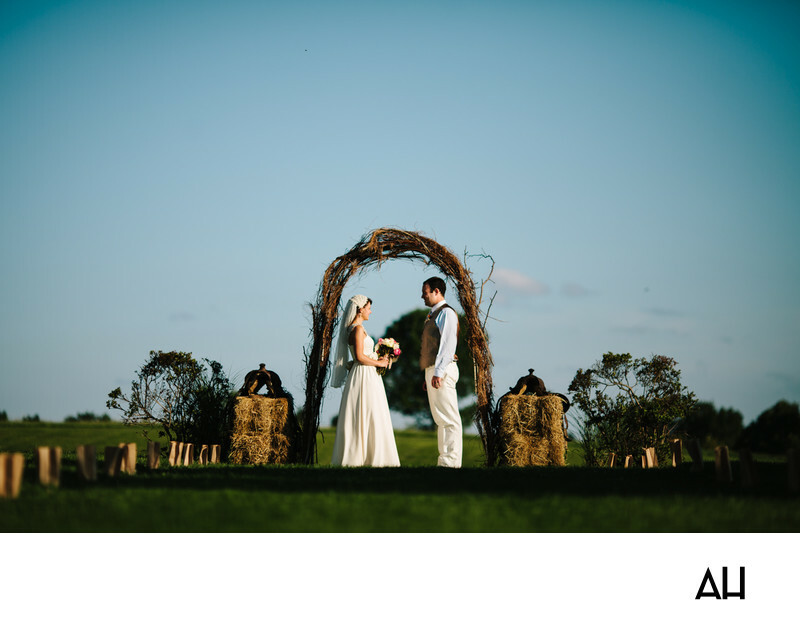 The couple in this photograph chose to have their wedding ceremony outdoors in the fields of Candlelight Farms. The newlyweds stand beneath an archway made from branches with stacks of hay on either side, after the wedding ceremony. Paper bags each containing a tea candle line the aisle that they pair had just walked down together. When the sky begins to darken, these bags will begin to glow. For now though, the sky behind them is a clear, brilliant blue that provides the perfect backdrop for their portrait. The grassy, green field spreads wide around them and gives the impression that they have been left alone in this enchanting place. In a way they have been, as the wedding guests have all retired from the ceremony to take part in the cocktail hour. However, if other people were still around, it would not matter; the newlyweds have eyes only for each other. The pair stand in the natural beauty of the scene grinning at one another, the happy expressions on their faces obvious even from a distance.